Assured: Caused someone to feel certain and sure about something. Towed: Pulled along behind something else with a rope or chain. Vehicle: A thing used to carry and move people or things. Action: Something that is done for a specific purpose. Object: A noun or noun phrase that is affected by the action of a verb in a sentence. Subject: A noun or noun phrase that is one of the main parts of a sentence. 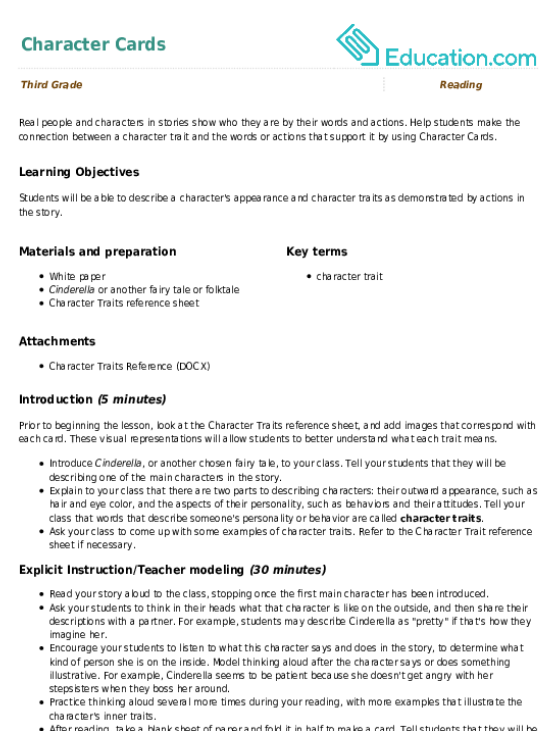 The subject performs the action of the verb. Verb: A word that expresses an action or a state of being. 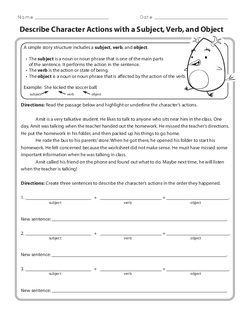 Students will be able to identify the problem, solution, and how the characters try to solve the problem. Students will be able to describe character actions in sequential order with sentence structure using strategic partnerships. Engage students by asking them about what they like to do. Record the verbs they use on the board. Explain that a VerbIs the word used to express an action. We are constantly in action or a state of being, so there are many different verbs that could be used to describe us in a single day. Tell the class that today's lesson will be about describing what characters do in stories. Give each student a set of Vocabulary Cards and call on volunteers to read aloud the information on each card. Offer additional explanation, as needed. With the word Subject, model turning the Vocabulary Card over and writing an example on the back (e.g., main character). 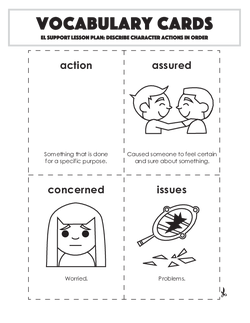 Instruct students to work with a partner to write an example of each word on the back of each Vocabulary Card. Have partners share out with the class. 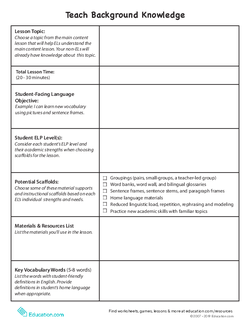 Distribute a Glossary to each student and instruct them to label the last column as Synonym. 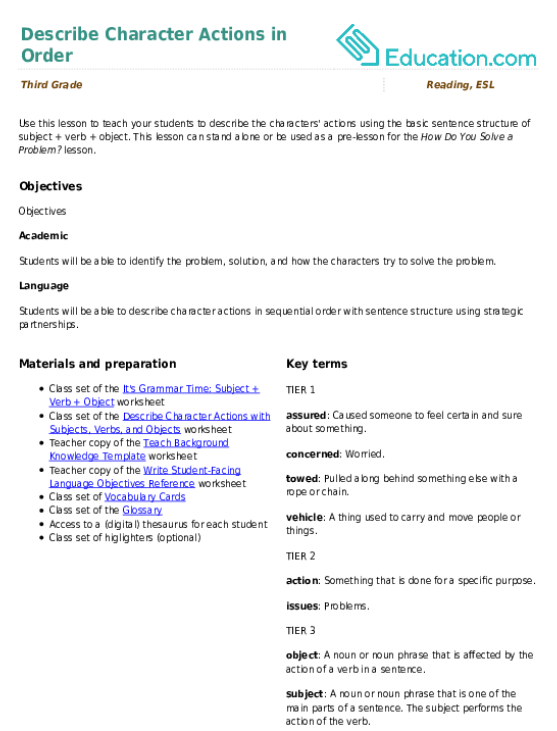 Model looking for a synonym for the word Subject(e.g., topic), using a thesaurus or a digital format. Give students time to work in their partnerships to add synonyms for each word. Share out as a class and record the best student answers on the teacher copy of the Glossary. Utilize this for the remainder of the lesson, as needed. Tell students that there is a simple sentence structure to use when describing characters' actions. When we use the subject + verb + object format, we can describe what the character does in the story. 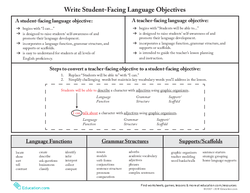 Distribute a copy of the It's Grammar Time: Subject + Verb + Object worksheet and review the key terms at the top. Read aloud the example sentence and point out the subject, verb, and object. Explain that students will look at the bank of words and phrases and choose from each of the rows and columns in order to create sentences. Model completing the first one on the worksheet for them, and then read the sentence aloud to show them how to self-check if the word order and context make sense. Engage the class in guiding you through the second example. Ask prompting questions, such as, "Do these words and phrases go together and make sense?" Place students into partnerships and instruct them to complete the rest of the first part of the worksheet. Note: They should not complete the bottom section of the worksheet, as this will be used for the Formative Assessment. Call on nonvolunteers to share their new sentences and have the rest of the class offer a thumbs up or thumbs down if they agree/disagree. 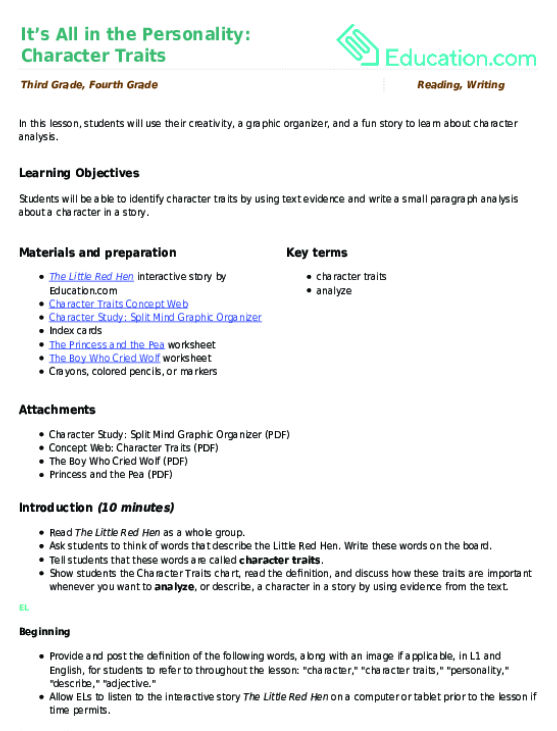 Give each student a copy of the Describe Character Actions with Subjects, Verbs, and Objects worksheet and review the information at the top. Read aloud the passage, and guide students through identifying the character's actions. Allow them to use highlighters or simply underline the action in the passage. Model how to create a sentence about the main character's first important action in the story. Go back to the passage to see what is underlined, and then create a sentence. Read aloud the sentence to ensure that the words are in order and that the context is correct. Instruct students to work in partnerships to complete the second and third sentences with the main character's important actions. Remind them to put the actions in the correct order. Call on nonvolunteers to share their sentences with the class. Provide feedback as needed. 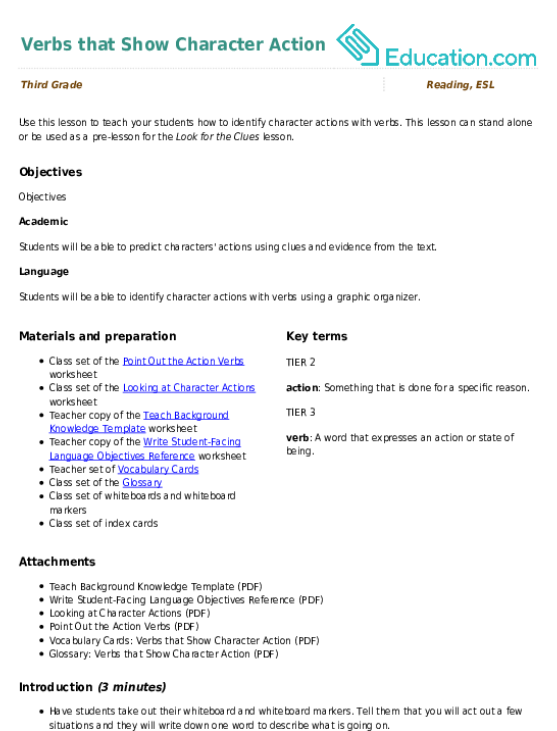 Allow access to reference materials in home language (L1). Have learners repeat instructions and key vocabulary to the teacher. Put students into partnerships with sympathetic peers or students with the same L1. Allow learners to utilize glossaries and dictionaries for unfamiliar words. 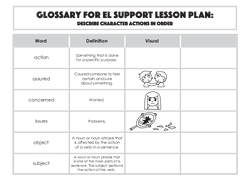 Choose advanced ELs to share their ideas first in group and class discussions. Have learners repeat instructions and key vocabulary, summarizing important information for the class. 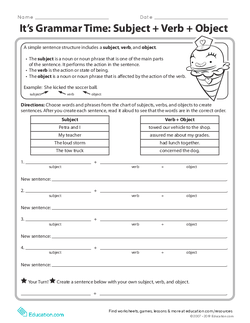 Instruct students to complete the sentence at the bottom of the It's Grammar Time: Subject + Verb + Object worksheet. Have students share their sentences from the bottom of the It's Grammar Time: Subject + Verb + Object worksheet with a partner. 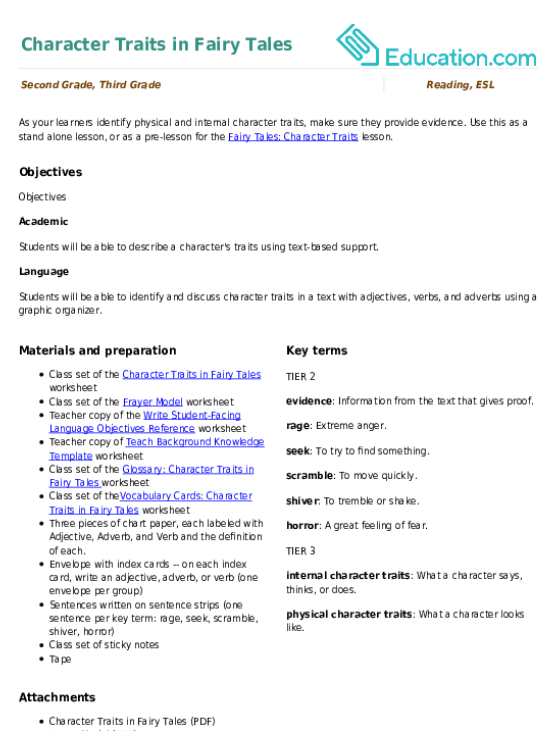 Then, call on nonvolunteers to share with the class. Remind the class that we learn a lot by looking at the character actions in a story, as well as paying attention to the sequence of the actions. The character's actions help to tell about the problem, important events, and the solution in a story.